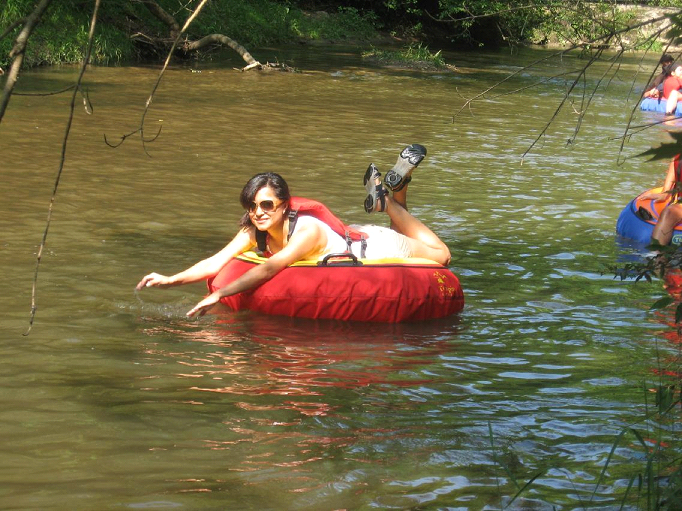 River tubing is one of Terrapin Adventure’s more popular off-site adventure events! Tubing is a fun, cool, and wet event you can do with your family and friends during the summer months. As you enjoy the water, you can also enjoy the sights and sounds of the wildlife and scenery surrounding you. While tubing, our professional guides will guide you to the right paths for the potential to see a variety of animals in their natural environment, such as frogs, turtles and fish. Being in nature can give you and your group a greater appreciation for nature and its wildlife. So, get ready to relax and float down the Patapsco River for 1.5 to 4 hours all depending on the flow speed of the river. When you choose to take advantage of river tubing tours, you and your group will be supplied with the tubes and life vests. You’ll also get a map that shows you how to get to a particular destination on your self-guided tour. It’s important to wear shoes that you don’t mind getting wet, as the shoes will protect you from river objects, such as rocks. You’ll also need a safe place to store your keys during the trip. Once you finish your trip, you can simply deflate your tube and load it in your vehicle for your return trip to the company’s base camp. Our tour guides will always put you and your group’s needs and safety first. Our tour guides require that all our tubing guests wear a life jacket and that all children be accompanied by an adult. You can rest assure that you will enjoy a safe and personally fulfilling river tour that will create memories for years to come. Terrapin Adventures provides popular river tubing tours. To find out more, visit http://www.terrapinadventures.com/tours-trips/river-tubing/. This entry was posted on Monday, December 8th, 2014 at 4:22 pm. Both comments and pings are currently closed.